According to Jouin, the work was still in the hands of David’s heirs in 1878 . Then there is no trace of it until now. On 10 February 2010 the Societé de Vente Volontaire Azur Encheres Cannes, with Me Pichon wielding the gavel, organized an auction which included various objects of no particular interest, some of them from inheritance estates. The sale had been announced only on the web site Interencheres which presents objects sold at auction in the provinces. One lot attracted some attention. 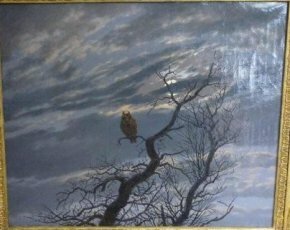 This was a painting in a beautiful gilt frame of the first half of the 19th century, representing a tree with no leaves on which an owl is perched (ill.). The style was reminiscent of Caspar David Friedrich and the bibliography on the artist, which includes the text from David d’Angers’ journal, provided the clues indicating the prestigious history of this work estimated at 80 to 100 euros. It seemed very likely that this was indeed the work belonging to David d’Angers. The painting came up at around 4 p.m. with a starting price of 100 euros, that is the high end of the estimate. At first, the bids climbed at 10 euros each then, after 1,000 euros, increased to 100 each. It took only fifteen minutes by the clock for the work to go for 350,000 euros to two well-known Parisian gallery owners : Bertrand Gautier and Bertrand Talabardon. Obviously, another buyer, or several, had recognized the canvas which would have otherwise fallen for 1,000 or 1,500 euros given the fact that the original estimate was too low for a painting in good condition, with a frame which alone was worth even more. On 9 March 2010, the two gallery owners received a summons stating that the seller demanded that the auction be cancelled and invoking article 1110 of the French Code Civil claiming mistaken merchandise. The story is outrageous in every sense. It is practically a déjà vu of the case of the two Poussin paintings, that acquired by the Louvre (the Saint-Arromans affair) and the one acquired by the Pardo brothers (see news item, in French, of 17/8/04). And yet, no matter how amazing and unjustified the endings of both cases, in which the buyers and sellers were forced to return the works, in this affair the issues are quite different. Indeed, the truth is that the description of the object was absolutely exact : this is a 19th century painting representing an owl on a tree. The issue of mistaken merchandise does not apply to the price but to the object itself. In the Poussin affairs, the painting was presented under a mistaken name : the Saint-Arromans Poussin was considered to be by “the Carracci school”, objectively false. For the Pardo Poussin, the catalogue listed it as : “Poussin workshop”. The judge considered that Poussin was not in his workshop, a very curious observation in itself. But one might argue that the expression “workshop of” means that the artist did not work on the painting, when in fact this canvas was finally acknowledged as being entirely executed by the master. Here, the attribution is not mistaken : it is in fact a 19th century painting. The mistake comes in the price estimate. What’s more, the auctioneer had not consulted with an expert (unlike what happened in the Poussin affairs). How can the buyers be accused of any wrongdoing simply because they acquired this painting at auction thanks solely to their knowledge, and taking a huge risk since they had never seen the canvas previously (and which they still have not seen although by law the painting now belongs to them). If the work had turned out to be a copy (or is one day determined to be so in the future), would the seller return their money ? Of course not. They are only doing their work, a task made much easier today with the help of Internet (alone responsible for informing them of the work and the auction), but at the same time more complicated as clients now know exactly how much they’ve paid for a particular work. All they have to do is click on Artprice or Artnet. This affair is likely to raise even more questions concerning legal uncertainties, which in fact exist only in France. What would have happened if the dealers who recognized this painting had not seen it and it had been sold for just a few thousand euros ? If it had been acquired by a second-hand shop owner, it might just well have disappeared again, perhaps forever. Or if sold to an unscrupulous dealer, it might have been exported immediately as often happens, alas, to many works so as to avoid any claim on them. If it had sold for a ridiculous price, a French museum would never have been able to acquire it in the future. In an open society such as ours, where information has never been available as quickly and openly as today, thanks in great part to Internet, auction sales must be guaranteed legally. Intermediaries should fulfill their role by ensuring their transactions are carried out in a responsible way. The Ministry of Justice should act to make sure this is the case and the Ministry of Culture would be wise to take an active interest in these sales as it is entrusted with protecting the nation’s cultural heritage. Thanks to Bertrand Talabardon and Bertrand Gautier, an important element of France’s heritage has just been brought to public attention and we would be willing to bet that registering it as a national treasure would eventually enable it to join a French museum. It is high time that case law which sets legal precedent, as well as the French legal system, clarify the workings of the French art market if the flight of masterpieces out of the country is to be stopped. Cf. Patrick Le Nouene, “Une aquarelle inédite de Caspar David Friedrich (1774-1840) conservée au musée des Beaux-Arts d’Angers », La Revue du Louvre, 1-1997, February, pp. 54-58. Cf. : Patrick Le Nouene, « Une aquarelle inedite de Caspar David Friedrich (1774-1840) conservée au musée des Beaux-Arts d’Angers », La Revue du Louvre, 1-1997, February, pp. 54-58. Patrick Le Nouene, op. cit., note 6. Patrick Le Nouene, op. cit., p. 54. Previous article in Heritage : Wintzenheim, more vandalism in the offing ?